Kate and Oli: Quoi de neuf? I have been a busy little bee! I am going to be launching two new websites soon AND introducing some new product lines into the shop. First, I will be launching a site that will act as a launchpad for my other sites, such as the store and the blog. This will be amazing as it will allow me to give out just one URL and yet you'll still be able to access all of my pieces of the web! Second, I will be launching a new site that chronicles my babysitting adventures. For years, I've been telling my family funny stories over dinner and they've been telling me to WRITE IT DOWN! So I did! I'm in the process of writing and compiling the adventures (and misadventures) of myself and my sister in our babysitting endeavors. My dad has a dream that we will get this published and end up on Oprah. I have a dream that you will pee your pants because you're laughing so hard. Hopefully, we can meet in the middle somewhere! As soon as these sites are live, I will be supplying you with the links, of course! As for the new product lines, I have recently discovered pebeo markers and I've been trying my hand and writing and drawing on ceramics. My (better) attempts will be listed for sale soon on etsy. I've also designed some adorable pencil sets that I will be listing as soon as I find a way to package them. Any ideas? If you were receiving a set of 6-10 pencils, how would you like them packaged? -*- Read Zoe's reviews of her favorite (and not so favorite) places to advertise her etsy shop on Sleepy Moon Design. 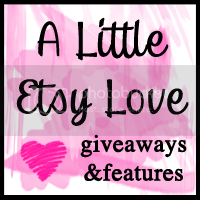 -*- One of my favorite blogs, Fleur Avenue, is having her first ever blog giveaway - your choice of a carousel necklace or a locket ring! It's really easy to enter, so head on over! -*- Check out these beautiful custom inital magnets from Rafya! Spell your name or favorite inspirational word! -*- The Rikrak Studio is hosting a giveaway and interview with the lovely Avril Loreti. Her designs are fresh, fun and super creative! -*- Super adorable ski cap candles from Anthropologie! These make me want to buy a lift ticket! -*- Rhianne at For The Easily Distracted has recently starting writing what she calls "little letters." I think these are an amazing idea and I just may start my own series of small thank yous and thoughts. Here are her little letters to the future and little letters to some lovely ladies. -*- I will leave you with some tunes from one of my favorite local bands - one that Adam introduced to me when we were first dating and therefore has turned into one of our "things" - Oak and Gorski (nee: Ken Oak Band). This song is called Trampoline and it was the second song Adam ever played for me - the first was Summer's Kiss. It's a beautiful song and I really think it showcases the cello stylings of Ken Oak. If you're in the Los Angeles area, there will be an acoustic show at Room 5 on LaBrea in Hollywood on Dec 4th at 8pm. Eeee, thank you for the mention, I'm so glad you like the little letters. I got the idea off Naomi from Rockstar Diaries if you love my letters you will adore hers!